Stuff Points: Earn 28 points when you buy this stuff. 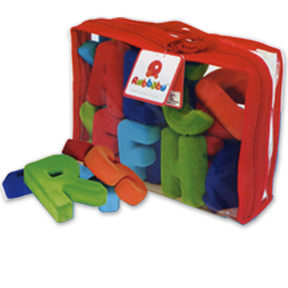 An alternative to traditional alphabet sets, the Rubbabu version is made from 100% natural rubber and then coated in a super soft and colorful, nylon flocking. Thanks to the great rubber material, these letters bounce when tossed or dropped, and are delightfully squeezable and soft to the touch. The large size, and silky, soft flocking make them perfect for small hands because they are easy to grip, and they feel great so children enjoy picking them up. The Rubbabu Alphabet Set is great for teaching letter recognition, proper sequencing and simple word formation. It will develop dexterity, problem-solving skills, color & shape identification, and so much more. Children can easily grab, hold and manipulate these great letters with less effort than with traditional versions thanks to the larger shapes, thicker sizing and the soft and squishy materials. This is the perfect set for parents that want to integrate sensory exploration and gross motor development while children are learning their letters. Kids can't help but notice the way each shape squashes as they apply pressure, or how velvety they feel in comparison to other objects. Simply taking them in and out of the included storage bag will help children to improve gross motor skills and hand-eye coordination as they begin to memorize letter shapes and names. These colorful toy letters are made entirely of 100% biodegradable, all-natural rubber so they are environmentally friendly and well suited for all ages. They are soft and squishy to the touch, yet sturdy enough to handle years of abuse. You can toss them around, step on them and much more without worry of damage to the toy, your home, or your precious bare feet. Perfect for child care centers, teachers, parents, or anyone interested in providing a truly unique set of letters for learning and enjoyment. They are a large size and have a thickness of about half an inch. This means they can be used flat, or standing on end. Kids can work with them flat on the ground, they can be stacked like blocks, and they can be lined up standing on a flat surface to form basic words or practice the alphabet. The large soft shapes are perfect for little fingers, and the bright colors and unique texture will keep children engaged for longer periods of time. When held, children can appreciate the texture and squishiness, while increasing their sensory awareness. The Rubbabu Alphabet Set is great for children of all ages. Smaller kids will reach for, roll and crawl to them. Over time they will begin to toss, stack and build with them, and in a short period, they will be showing you which letter is which. Older children end up spelling small words, naming their favorite letters and playing more advanced games with them. Safe and natural materials ensure a high quality toy that children will play with for years to come. Bright colors, soft textures, and a super squishy and bouncy make-up help these letters to be truly unique. They are perfect for the development of socialization and gross motor skills as well as sensory enhancement. 100% biodegradable and tested safe. Rubbabu is made with natural rubber instead of the synthetic stuff used by other manufacturers. It comes from the sap of the tree, so nothing is cut down or destroyed to extract it, and the material is completely renewable. Other rubber products will contain fillers that lower the quality and make the rubber less sturdy. With Rubbabu, there are never any fillers, so you get a stronger, more durable rubber toy that will last for a long time. Another benefit beyond flexibility and strength is that this natural rubber is anti-microbial, dust mite resistant, mildew resistant, hypoallergenic and flame retardant. You can feel good about purchasing a toy made from renewable resources, and even better knowing that your children will be safe when they play with it. With Rubbabu even the manufacturing process is eco-friendly because only a very small amount of electricity is needed to produce each one. 26 pieces. Uppercase. Order Yours Today! Dimensions (w x h) 2" x 2.75"
Rubbabu Alphabet Set - Great toy letters made from natural rubber. Soft and squishy, the Rubbabu Alphabet will improve motor skills, encourage communication, increase sensory awareness and provide hours of stimulating play. Boys and girls alike will love these uniquely textured rubber letters. Order Yours Today! I know that some of the Rubbabu letters and numbers are magnetic. I see no indication of this in the description. Are these magnetic? This set is NOT magnetized. Suction Construction. 8 Different Shapes That Stick And Flex For Building Fun. Clickity-Clack. Fun animal shapes with moving parts and amusing cracking sounds.